K.C. 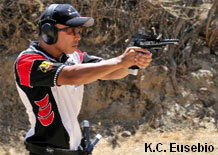 Eusebio, who grew up in Southern California, returned to his home turf to capture the Men’s Championship at the 2010 Steel Challenge this weekend in Piru, CA. This was K.C.’s third overall win at the Steel Challenge. Trailing Team Glock’s Dave Sevigny for much of the match, K.C. pulled ahead in the final three stages to capture the Overall title, his third Steel Challenge Championship, with an 80.27 second total time. Right behind was Sevigny at 82.84. 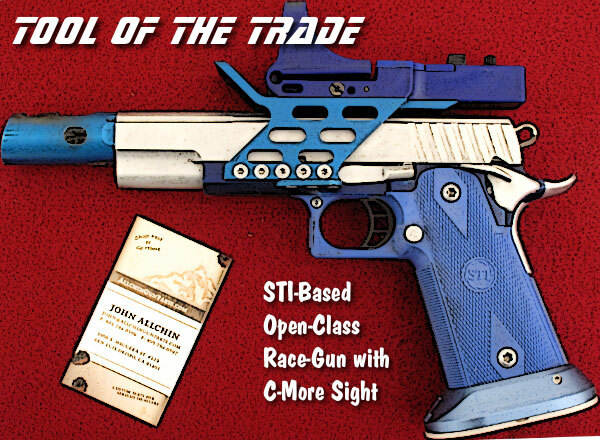 That was an impressive performance considering Dave was running a modified Glock against “full-race” 1911 customs, some of which cost $3500 or more. Even more amazing was the legendary Jerry Miculek, who finished third shooting a Smith & Wesson revolver with iron sights. Jerry’s total time was 83.88. In the womens’ Division, new Team Smith & Wesson shooter Jessie Abbate of Georgia won her second consecutive womens’ Steel Challenge Championship, and the third in her career. In addition to winning the overall title, Abbate won the Ladies Steel Master title which represents the best combined score of the Open, Limited, and Rimfire events. Jessie won the Rimfire event on Day 1, having the best time on all but one of the eight stages. After that Jessie was locked in a tough battle with her S&W teammate Julie Golob, who captured the Limited Event on Friday (Day 2). In a video interview with AccurateShooter.com, Abbate confessed to being “off her mental game” on Day 2, but she pulled it all together on Saturday (Day 3), capturing the Ladies Overall and Steel Master titles. Kay Miculek, a seven-time Women’s World Speed Shooting Champion, finished second. Watch the video below for a lengthy interview with Jessie. NOTE: The video has loud gunshot noise. Turn down your speakers if at work. Another up-and-comer in the mens’ ranks is 17-year-old Ryan Leonard from Oregon. Ryan took the rimfire title, beating all the older sponsored pros in the process. Ryan finished tenth overall (among all competitors) to win the Junior World Speed Shooting title. Ryan has speed to burn and exceptional accuracy. Ryan actually prefers centerfire handgunning, but he obviously knows how to get the most out of the low-recoil rimfire pistols (Ryan shoots a modified Ruger MKII). When asked for his secret of success, Ryan smiled and said: “Don’t miss — Shoot the best you can, but don’t miss.” Ryan is a gifted student-athlete, currently taking college courses while completing his high school education. We expect Ryan to be a major player in the speed-shooting game in the years ahead. He is skilled, dedicated, and gifted with exceptionally fast reflexes. 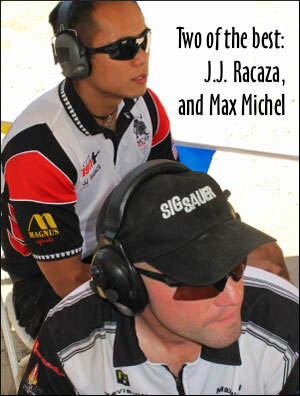 If there was a crowd favorite among all the competitors it might be J.J. Racaza who was one of the strongest competitors on the History Channel’s popular new Top Shot TV show. A blazing fast shooter who exhibited the ability to learn new skills quickly (such as archery and knife-throwing), many viewers favored J.J. to win the whole competition. He was the most consistent performer on the “Blue Team” throughout the show. Share the post "K.C. Eusebio and Jessie Abbate Win 2010 Steel Challenge"
Luckygunner.com is a rapidly-growing ammo and shooting supplies vendor with a unique business model. Luckygunner.com guarantees that all products displayed on its website are in stock. Using an advanced “real-time” inventory system, Luckygunner.com promises that “what you see is what we’ve got.” You can count on receiving your order within a few days, and not be caught in the uncertainty and delays of back-ordering. LuckyGunner.com recently obtained its Federal Firearms License (FFL) and plans to begin offering firearms for sale on its website in the coming weeks. Luckygunner is expanding to sell firearms (through local FFLs) in response to customer requests. 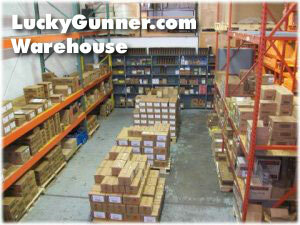 The same In Stock-Shipping policy applies to all LuckyGunner.com inventory — including firearms. Luckygunner.com promises: “If you see it on our website, it will be in stock and ready to ship. Every time. No exceptions.” When you order before 3pm EST on a business day, your order will ship the very same day. NOTE: Purchasers do not receive firearms directly. The buyer provides contact info for a licensed firearms dealer (FFL) in the buyer’s vicinity. The firearms are shipped to the FFL, and the buyer must then comply with all Federal, state, and local laws before taking possession of the gun(s). Share the post "LuckyGunner.com To Sell Guns as Well as Ammo and Supplies"